My home solar electric panels were officially connected to the grid (Consumers Energy) December 19, 2009. The snow did not clear off the panels until March 2010 when power generation began. The rated capacity of the panels is 2.45 kilowatts. My panels are on an East facing roof with shade trees to the West, so the panels operate at about 80% of ideal. 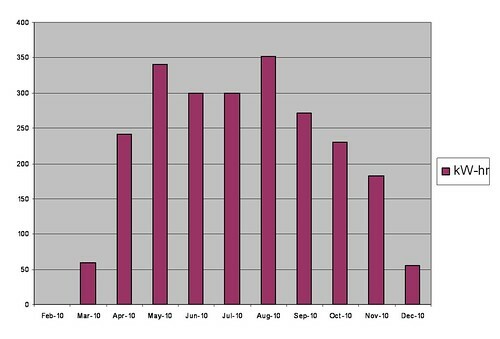 About 40% of my annual household electric power use was supplied by my solar panels. You can tell I had a sunny spring and a rainy June! The next chart compares the power generated with the power used by my house. I multiplied the power used by .4 to normalize it against the annual power generated by my solar panels. If I wanted to generate the same amount of power I used during the year, I would need to have 6 kilowatts of solar panels instead of the 2.45 kilowatts I have now. 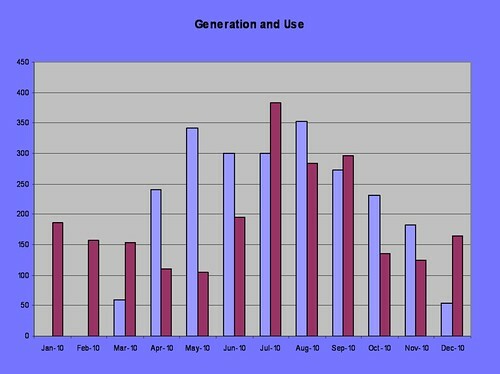 Blue bars are generation, gray bars are power use. You can see that I took my vacation in the August use reading. The drop in use reflects less air conditioning needed while I am out of the house. Wait, you're getting paid $.60/kWh? And you're still looking at a ten year payback? That's pretty depressing. A lot farther from economic viability than I'd hope to see. This is why you haven't seen more roof tops covered with solar panels. It still takes a substantial subsidy to justify installing solar panels. On the other hand, since the peak of production matches the power demand peak, it may be worth the subsidy if it avoids installation of new fossil fuel power capacity that takes a 30 year payback time.